↑ Itamar Rabinovich, Symposium: The Greater-Syria Plan and the Palestine Problem in The Jerusalem Cathedra (1982), p. 262. ↑ ক খ গ Zeine N. Zeine. 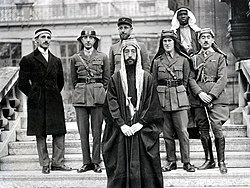 Struggle for Arab Independence: Western Diplomacy and the Rise and Fall of Faisal’s Kingdom in Syria. Caravan Books. Delmar, New York. 1977. ↑ ক খ গ Efraim Karsh and Inari Karsh. Empires of the Sand: The Struggle for Mastery in the Middle East 1789-1923. Harvard University Press. Cambridge, Massachusetts. 1999. ↑ ক খ গ ঘ Eliezer Tauber. 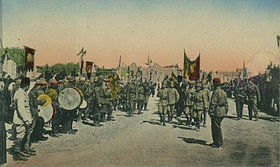 The Formation of Modern Syria and Iraq. Frank Cass and Co. Ltd. Portland, Oregon. 1995. আইএসবিএন ৯৭৮-০-৭১৪৬-৪১০৫-৮.